On July 2nd1852 the Zuber factory patented a process to print velvet on paper and fabric. Better known as flock, this consists of gluing a thin layer of dyed wool onto the base. Once the background is brushed, the printer uses the woodblocks to apply glue. Before it has dried, he sprinkles wool powder through a screen. The pattern made by the glue retains the wool. The paper is then carefully shaken using thin wooden sticks. This really slow process is reiterated along the drop. 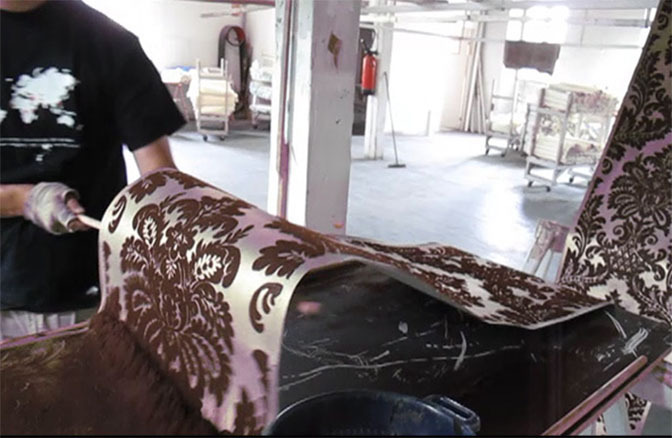 Printing of a damask pattern from the “Baroque” collection in the Velveting workshop.